Triathletes Journey: A "He said, She said" reporting on races and events: Day 7: March, rolling in like a sea lion, out like a Pacific Spotted Dolphin? Day 7: March, rolling in like a sea lion, out like a Pacific Spotted Dolphin? 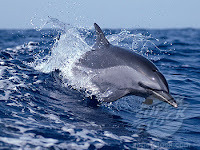 Elle: Apparently the Pacific Spotted Dolphin is a very fast sea creature, reaching speeds of 24.7 mph. Elle: Looking forward to the sun setting later, and enjoying some after work, outdoor runs, rather than getting on the 'mill. Especially when the treadmills at the gym are in a room with no windows, and I was just under the fan, so while Webb was being delightfully cooled off during his 5 miles, I was next to him, sweating my face off. Webb: This was a good run, mostly because I think Elle is starting to accept she does not need to try to win every workout. I am also looking forward to running outdoors more. As narcissistic as this blog is that does not mean I enjoy staring at my reflection for 5 miles. To distract myself I started doing race-day visualizations. That was a bad idea because it jumped my HR by about five points. I also noticed that if my stride rate dropped below 90rpm my HR would also go up by about five points. So no motivational visualization and a high RPM are necessary for me to stay in Zone 2. Elle: I like swimming after running, because I'm all warmed up for the swim, plus jumping into the pool is refreshing, rather than arresting. Webb: I'll echo that. Although, it was disappointing we had to cut the workout short because we only had 50:00 before the pool closed. I cut a sizable chunk from the warm-up since as Elle points out, we were pretty warmed up already. I have to say this is a modified workout that came from either Gale Bernhardt or virtualswimcoach.com. I cannot remember which. One of the ways I modified it was to add 2x100 IM at the end. While I was waiting for Elle to finish her last 4x100, I decided to squeeze in one of the IM sets. I'm glad I did.